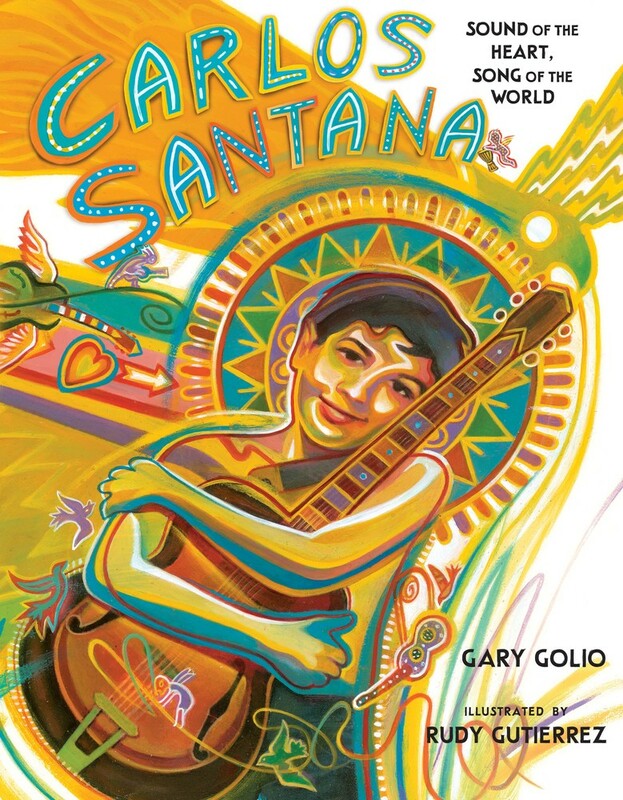 Currently viewing the category: "Biography/Autobiography/Memoir"
Summary: Discover the childhood story of Carlos Santana in Gary Golio’s Sound of the Heart, Song of the World, featuring illustrations by Rudy Gutierrez,the internationally celebrated artist who created the iconic Carlos Santana Shaman CD cover. My Review: I absolutely loved this book. My son and I had so much fun reading it, and then he asked to listen to some of Carlos Santana’s music. A few days later, we heard a Carlos Santana song on the radio, and my husband excitedly reminded my son about the book. It feels good to connect him with such a powerful man in our history. He shaped music in powerful ways. The book is beautifully written. I liked how it focused predominantly on Santana’s childhood. This kept my son’s interest and helped him connect with Santana. The art flows beautifully and looks like visual music on the page. Teachers’ Tools for Navigation: I would love to use this book in literature circles with kids. Students could each read a picture book about a famous person in our history of music (see some of the options below). They could share out to their peers and play a clip from the music. These interdisciplinary activities would make for a warm, powerful learning environment. What was Santana’s relationship with his parents? How do you think this may have shaped his life? What did working beside his father teach him about himself? Describe Santana’s journey into music. What influenced him? Flagged Passage: Check out the beautiful interiors on the book’s Macmillan page. 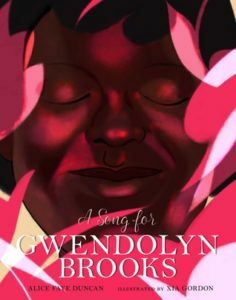 As I receive and read picture books, I put aside books that I hope to get to write a post about; however, my pile has gotten so big because of all of the amazing books coming out, that I cannot give them each their own post. 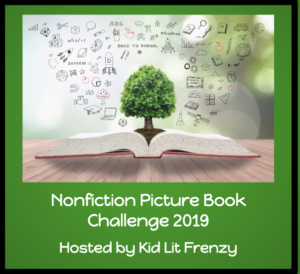 So every once in a while I do a picture book round up, and today I am happy to share some of my recent favorite nonfiction reads (Friday I will share fiction titles). Please know that putting these in a round-up does not lower their value! They are all ones that I recommend and loved! Summary: “Cats of Instagram” meets National Geographic in this hilarious picture book about nature’s cutest weirdos from the author of Pink Is for Blobfish! 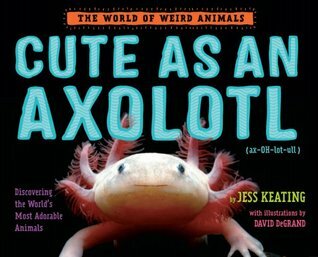 My Thoughts: I love how Jess Keating finds a topic like bright colors or cuteness then shares some of the weirdest and most wonderful creatures, but she doesn’t stop at just that, she includes tons of information about the animals accompanied by a beautiful photograph and fun facts and illustrations. Keating is quickly becoming one of my favorite animal nonfiction picture book authors. Summary: Explore a world that existed millions of years before people lived on the Earth, when extraordinary animals roamed the land. From the fierce Tyrannosaurus rex to the birdlike Compsognathus, the hidden wonders of the dinosaur world are revealed. My Thoughts: Shine-a-Light books take a topic that is already interesting and adds an interactive aspect to the book. Every book from this series has been a book that Trent loves, and this one is no exception. 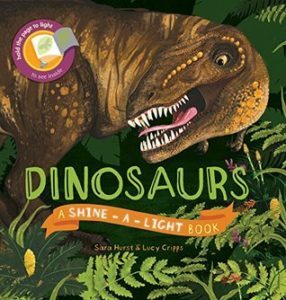 Each page shares information about different dinosaurs and some of the animals that lives with dinosaurs. I really liked that the authors didn’t dumb down the book, including scientific names and information. All with things hidden behind the page that can only seen when you shine a light. 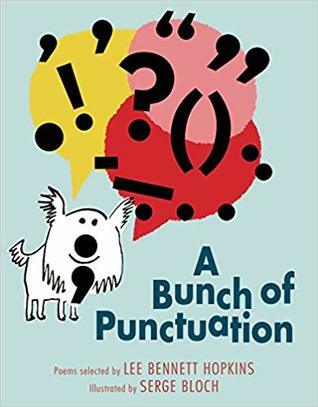 Summary: Selected by noted anthologist Lee Bennett Hopkins, this collection of all-new poems is written from the points of view of personality-filled punctuation marks, and is a memorable introduction to grammar for children ages 7-12. In this land of punctuation, the exclamation mark is a superhero who tells a story chock-full of bops and bams, the comma lets you pause to enjoy the weather, and the period is where you must come to a full stop–or else the Grammar Police will get you. With humor and imagination, A Bunch of Punctuation makes it easy to remember the jobs of the various punctuation marks. Award-winning poet and anthologist Lee Bennett Hopkins has compiled a unique collection of poems featuring brand-new works by well-known poets, accompanied by inventive artwork by illustrator Serge Bloch. My Thoughts: Lee Bennett Hopkins poetry anthologies always exceed my expectations which is impressive since the bar is higher and higher each time I read one. And this one is about punctuation, and it is still so well done! I, personally, am so excited to use these poems when I do my grammar & punctuation unit with my journalism class–it’ll add a little bit of humor and poetry to the unit. 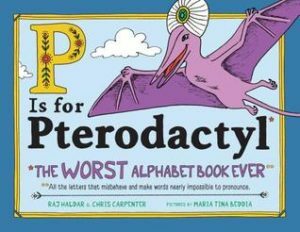 Summary: From wacky words to peculiar pronunciations, get kids excited about language with this unconventional alphabet book from Raj Haldar (aka Lushlife). My Thoughts: This book probably cracked me up more than it should have! I immediately started reading it out loud to my family because it is just so good! I always talk about what a complicated language English is, and I remind my students learning English of the same thing, and this book literally illustrates this. With words like knot, ewe, you, and mnemonic, this is an alphabet book that is different than others out there. 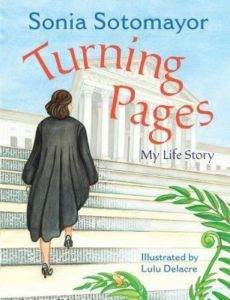 My Thoughts: Reading about Sonia Sotomayor is always so inspiring, but reading her story told to me with her voice just brought tears to my eyes. Reading about how books and education lead to her position as a Supreme Court Justice shows the power in words. And she writes beautifully! The language she uses is beautiful as well: “The library was my harbor, and books were little boats that helped me escape sadness at home.” & “Books were teachers, helping me sort out right from wrong.” LOVE! Summary: Meet Raye Montague–the hidden mastermind who made waves in the U.S. Navy! After touring a German submarine in the early 1940s, young Raye set her sights on becoming an engineer. Little did she know sexism and racial inequality would challenge that dream every step of the way, even keeping her greatest career accomplishment a secret for decades. Through it all, the gifted mathematician persisted–finally gaining her well-deserved title in history: a pioneer who changed the course of ship design forever. My Thoughts: Wow! 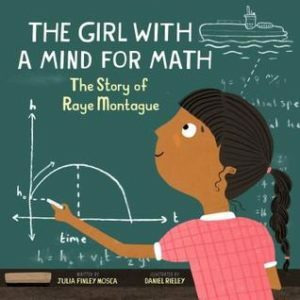 Raye Montague’s story is fascinating! In a time here in America where segregation and racism ruled, Raye wouldn’t let anyone else’s ignorance stop her from reaching the heights that she knew she was going to reach her entire life. Each barrier she faced, she found a way around it. What a wonderful story of perseverance! The narrative itself is told in a rhyming verse that takes us through her life, but the real depth of her story can be found in the back matter. Summary: A cool idea with a big splash. My Thoughts: I have wanted to read this one since it came out, so I am so glad to finally get around to it. 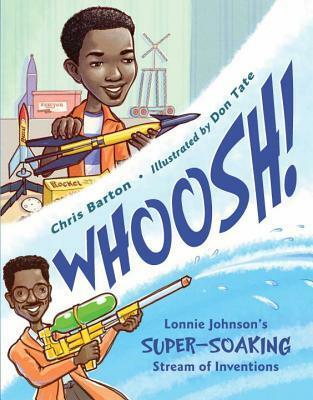 I was already a huge fan of Barton’s and Tate’s, so I had high expectations, and Whoosh! met all of them: interesting, humorous, beautifully illustrated, and informative. Lonnie Johnson is another brilliant mind that I am so happy there is a book about, and his story shows the genius and hardships behind any type of invention. Summary: An interactive look at endangered animals imploring readers to discover fifteen species facing extinction. Inspired and endorsed by the “Red List” database of animals in peril maintained by the International Union for the Conservation of Nature (IUCN) this brightly illustrated book introduces species from six different habitats on six continents. Blending approachable text, secondary facts and lush art, Red Alert! offers full portraits of animals such as the Chinese giant salamander, the snow leopard, the blue whale, and the giant panda, and provides young activists additional resources for how they can help save these beautiful creatures. My Thoughts: Red Alert is different than any other book like this that I’ve read. 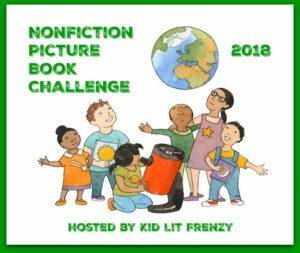 It is a choose your own adventure-like nonfiction book about endangered animals in different habitats around the world. 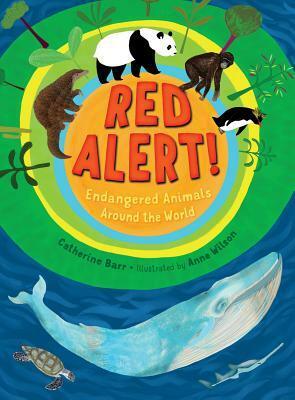 Each animal has a full spread with a nonfiction narrative about them, facts, and why the animal is in danger. The book then ends with ways to save the creatures. The beautiful illustrations bring the animals to life while the interesting information shows the critical situations these animals are facing. 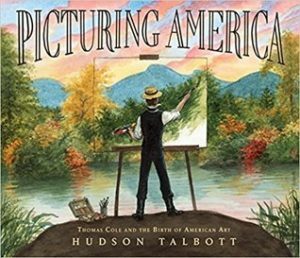 Summary: This look at artist Thomas Cole’s life takes readers from his humble beginnings to his development of a new painting style that became America’s first formal art movement: the Hudson River school of painting. Thomas Cole was always looking for something new to draw. Born in England during the Industrial Revolution, he was fascinated by tales of the American countryside, and was ecstatic to move there in 1818. The life of an artist was difficult at first, however Thomas kept his dream alive by drawing constantly and seeking out other artists. But everything changed for him when he was given a ticket for a boat trip up the Hudson River to see the wilderness of the Catskill Mountains. The haunting beauty of the landscape sparked his imagination and would inspire him for the rest of his life. The majestic paintings that followed struck a chord with the public and drew other artists to follow in his footsteps, in the first art movement born in America. His landscape paintings also started a conversation on how to protect the country’s wild beauty. Hudson Talbott takes readers on a unique journey as he depicts the immigrant artist falling in love with–and fighting to preserve–his new country. My Thoughts: I am a sucker for biographies of artists. The Hudson River artists may not have painted in my favorite style, but no one can argue with their beauty and Cole’s paintings were the start of the first truly American Art style. 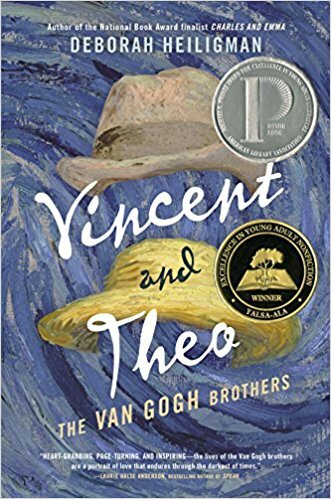 Talbott’s story of Cole did a beautiful job focusing on how he found his passion, the hardships he faced to be successful, and his passions other than art. Cole loved the environment and saw even then that we were going to lose it if we didn’t take care of it. I also truly loved the inclusion of some of his paintings. 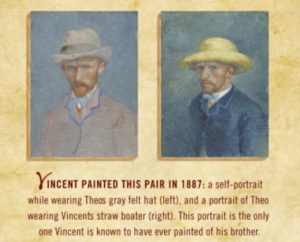 Often, in picture book biographies, the actual paintings aren’t shown, so I found that really helpful. Summary: Puny? Poky? Clumsy? Shy? A lighthearted look at the surprising traits that help some animals survive. 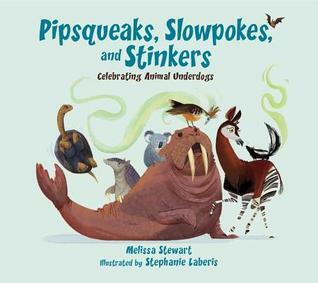 Written with a lively, playful voice, Pipsqueaks, Slowpokes, and Stinkers introduces young readers to a variety of “animal underdogs” and explains how characteristics that might seem like weaknesses are critical for finding food and staying safe in an eat-or-be-eaten world. Award-winning author Melissa Stewart offers readers a humorous and informative nonfiction picture book with a gentle message of understanding and celebrating differences. Stephanie Laberis’s bright, bold–and scientifically accurate–illustrations add to the fun. Summary: You can be a King. Stamp out hatred. Put your foot down and walk tall. 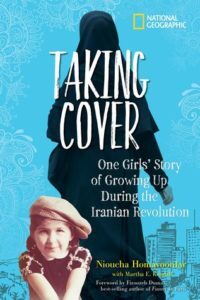 Review: I am so happy that a book like this exists! It makes a beautiful connection between King’s history and how the same concepts can (and should!) drive us today. The book is very young kid friendly and is a great scaffold to talk about Dr. King or about kindness; however, it could also be used with older kids to infer and go deeper into the lyrical language Weatherford uses. 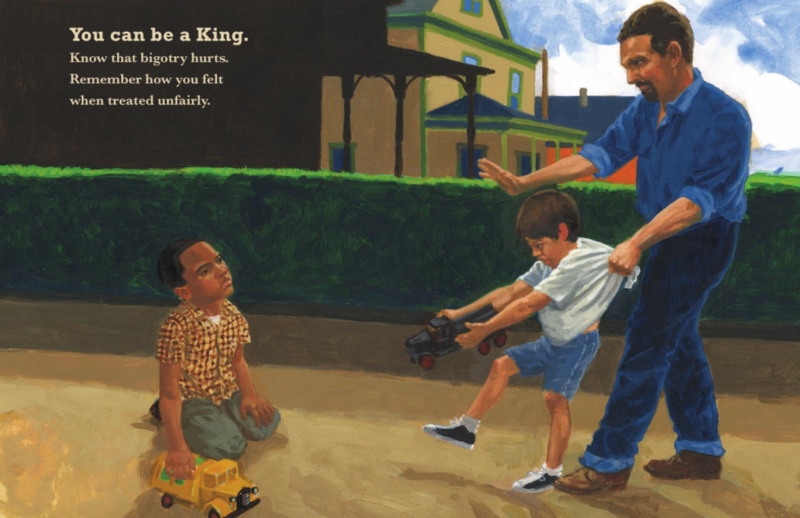 I also loved how Ransome’s illustrations changed between King’s biography and the more contemporary school narrative. P.S. As a teacher and a person who believes in kindness and equity and acceptance and friendship, I am so happy to see conversations like this happening so freely now! My students and I speak about injustice and prejudice and equity so often now when it would have been a stigma just a few years ago to even mention race or other social justice issues. It is important to talk about race in a non-prejudicial way with children to allow them to learn and grown and reflect. Sadly, it has been through horrific injustices that has gotten us to this point, but hopefully with our future generations having these types of conversations starting at such a young age, these injustices will stop. Teachers’ Tools for Navigation: Have students look at each school spread (or split up the spreads between groups of students) and ask them to connect the ideals happening in the spread with something that King spoke about. 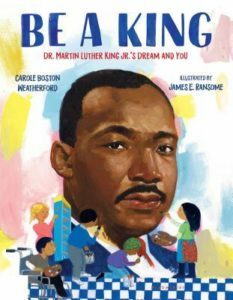 This idea can also be used with the King spreads because it does not explicitly state what historical event each spread is representing, so students could look through King’s story and try to match each illustration and words with an event in his life. What was Dr. King’s dream? What are some ways you can fulfill this dream? 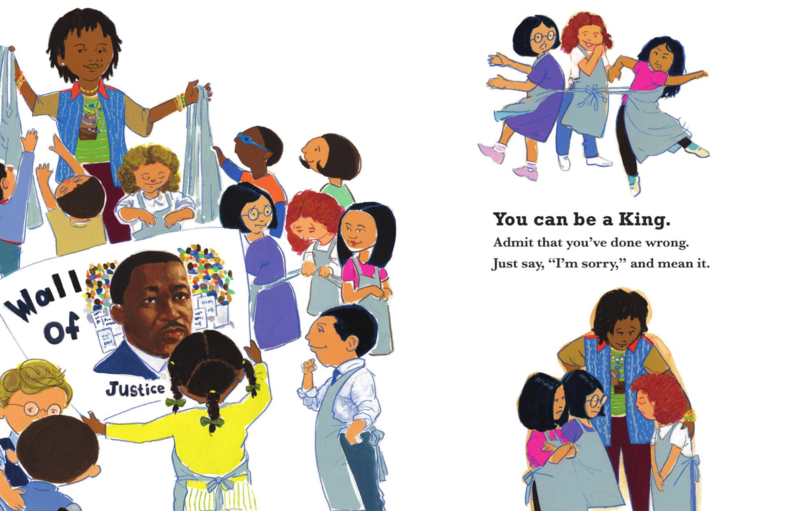 Although he was speaking of a much larger issue than a classroom, how can King’s ideals be transferred to how we treat each other in the classroom? What events of King’s life were portrayed in the illustrations? What other ways could you BE A KING? Why do you believe the author wrote this story? 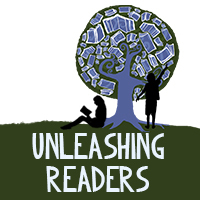 What is the author trying to teach the reader? How did the author structure the story to reach her purpose and theme? The illustrators included are: Art Adams, John Cassaday, Jim Cheung, Amanda Connor, Carlos D’Anda, Michael Gaydos, Gene Ha, Stephanie Hans, Bryan Hitch, Phil Jimenez, Siddharth Kotian, David LaFuente, David Mack, Alex Maleev, Francis Manapul, David Marquez, Steve McNiven, Rags Morales, Saumin Patel, Nate Powell, Stephane Roux, Marco Rudy, Kamome Shirahama, Bill Sienkiewicz, and Abhishek Singh. 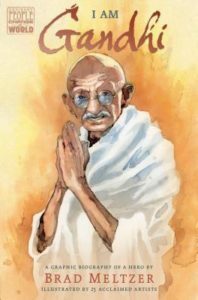 Kellee’s Review: I’ll be honest–when I first read on the cover that 25 different artists illustrated this graphic biography, I was worried that the stagnation of illustration styles would hinder the narrative of Gandhi’s life, but I was so wrong. Instead, by allowing each illustrator to give us their interpretation of Gandhi, his spirit instead flowed through the pages as it was obvious that his story had touched each and every artist, and the author, taking part in this graphic biography. While reading, it was clear to me that Meltzer wanted Gandhi’s message of equality, peace, and kindness to scream at the reader, and this was confirmed when I read the Washington Post article about Meltzer’s inspiration. 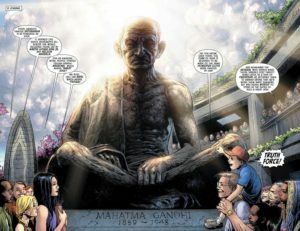 I believe Meltzer did a beautiful job not only telling Gandhi’s story but also showing that peace is possible in a time of tumultuous relationships but that the only way to truly achieve it is through similar activism as Gandhi. Ricki’s Review: I read this graphic novel twice to myself and twice with my son. Further, I’ve read portions of it to my students. I can’t stop sharing it! I was blown away by the amalgamation of the 25 graphic novelists—it made for an absolutely stunning text. 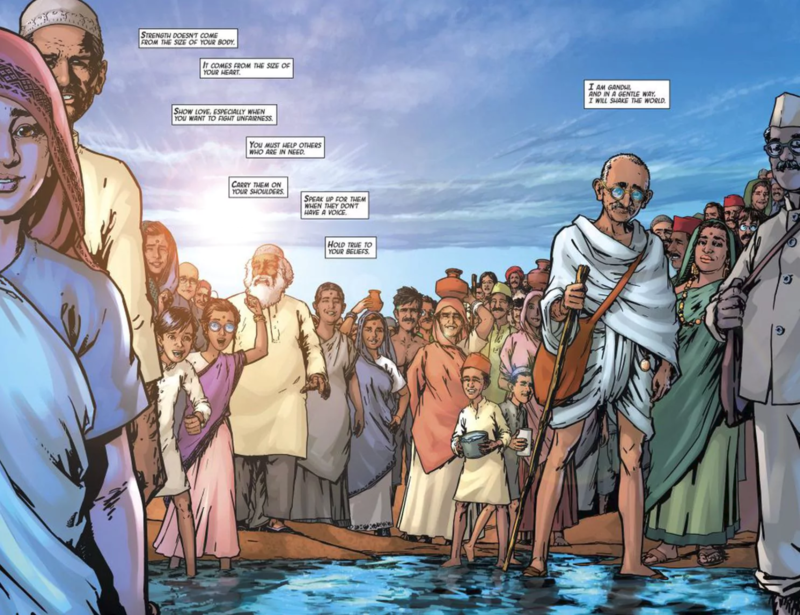 I appreciate the historical perspective that extends throughout the graphic novel, and I loved that the illustrations really make Ghandi’s story come alive. This is a book that I will share often and widely. If you haven’t read it, I recommend it highly—even if you already know a lot about Ghandi’s life. 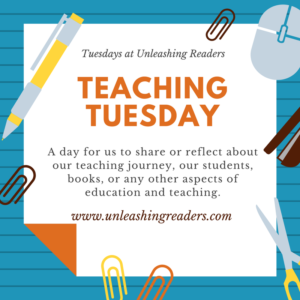 Teachers’ Tools for Navigation: Have students connect Gandhi’s philosophies to those who influenced him and those he influenced. For example, in one of my literature classes, one person picked an author who was influenced by another (for example, Woody Guthrie was influenced by Walt Whitman) then the next student built on that (for example, Bob Dylan was influenced by Woody Guthrie OR Ralph Waldo Emerson influenced Walt Whitman) until a complete chain of influences were made. Then each student wrote an analysis paper showing how they were influenced then presented their findings (in order of influences) to the class. This same idea could be done here: Henry David Thoreau influenced Gandhi who influenced Martin Luther King, Jr. who influenced Barack Obama who influenced Cory Booker, etc. This idea could also be used just to look at the idea of peaceful protests that have changed the course of history: Gandhi, MLK, Black Lives Matter, Never Again, etc. What is the theme of Meltzer’s story of Gandhi? How did Gandhi change the course of history for Indians in South Africa and India? 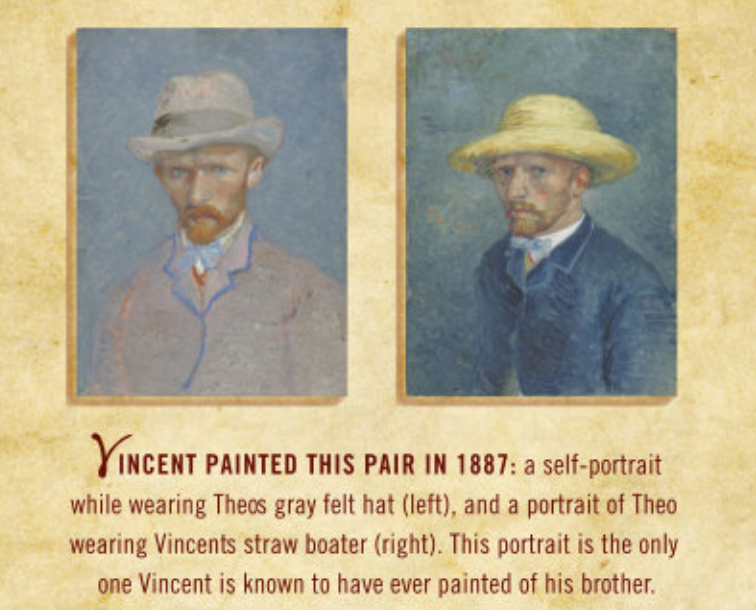 How did the 25 different artists illustrating the graphic novel affect the reading of the biography? How did Thoreau influence Gandhi? Can you infer how Gandhi influence Martin Luther King, Jr.? What was the importance of Gandhi’s march to the sea to hold salt? Why do you believe Meltzer chose the specific quotes he included in the back matter of the book?